Hostile creatures in CoR can be easily identified by selecting them. 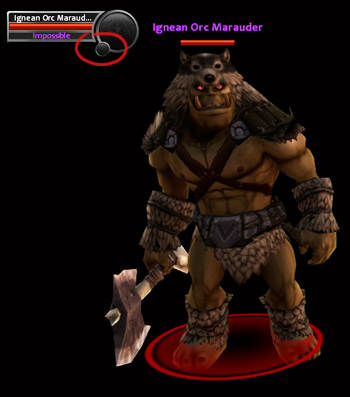 A red circle will be at their feet and in the information square on the top of the screen, there will be no realm in the small grey circle. 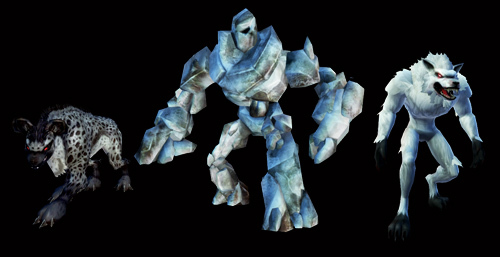 The color of its name reflects the creature's level in the game. The colors do not designate an exact level but give you an idea of the level range you can expect. A creature that does not present a challenge and is considered worthless to kill. These creatures don't give experience or any reward. Very little experience and gold reward that may not make it worth your while. Better experience and gold will be awarded. You may want to attack it if the creature is in your path but may not be worth going out of your way for it. You will find the experience and gold rewards appropriate for the challenge. You will find the experience and rewards better than light blue but slightly more challenging to kill. You will find the experience good and rewards helpful but the creature more challenging to kill. You'll will want to make sure that your character is at full health for this challenge. You will find the experience good and rewards very helpful but the creature most likely requires a party to be killed. You will find the experience good and rewards extremely helpful but you'll require a party to attempt to kill it and even then your character will most likely perish. Killing any creature at or above the Yellow level will yield bonus experience. Inexperienced players with poor equipment should target creatures at the Light Blue level or below. Experienced players could target "Normal" to "Above Normal" creatures. It will take good equipment and the use of powers to take on creatures with an Orange level or higher. These colors will change if you are in a party and the colors will reflect the difficulty for the party. For more on parties, read the Parties section. In a zone that you see a group of creatures of one kind, there might be Leaders, which are the same creature but stronger. It's recommended to get help before attacking them. Of course, the reward will be better than a normal creature's. 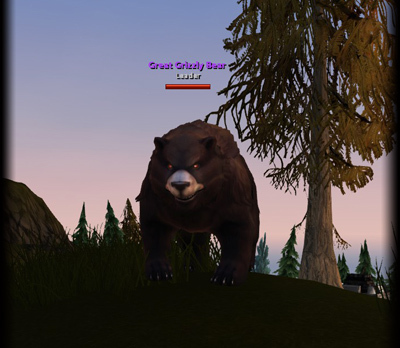 As you go exploring the map, you'll find that in some locations there are special creatures that are a bit different from the rest. These are champion creatures which will be mentioned in some quests and also they might be part of an interesting story. This kind of creatures will be your first glance at what a challenging fight will be. Located near the last cities you'll visit before going to war, you will find Legendaries which will make you team up with new friends and have an enjoyable group action. They are not always there, as when they are defeated they'll hide for a while. Now we are talking about a big fight. Epic Bosses are not joking, better not get close to them alone. You'll see them, from time to time, appearing in the war zone. You might gather an army before facing them, but don't worry, as soon as they appear everyone gets together to go fight them. There are great rewards for killing them such as epic weapons, amulets and rings. Worth a try! In Ignis, Daen Rha is a igneo roaming somewhere in Samal surroundings. 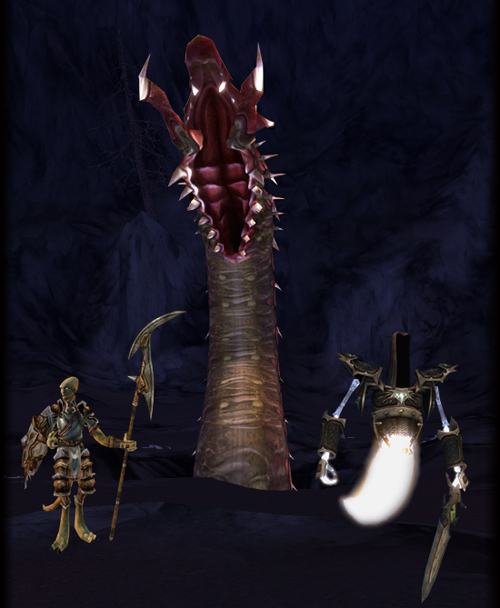 Alsius has Thorkul, a giant worm that will literally eat you and Syrtis has Evendim, a glowing ghost with a sharp blade. Scary, aren't they?